We Ursulines owe a particular debt of gratitude to Nano Nagle, born in Ballygriffin Co. Cork, Ireland in 1718 as she was responsible for bringing the Ursuline presence to Ireland. About the year 1765, when Nano had already spent more than ten years at her work of organising and supervising schools for the poor and destitute in various parts of Cork city, it became clear to herself and her friends that it was simply not feasible to carry a one – woman project much longer. Nano had lit the lantern. She realised she would need help with her work. She decided to set up an Ursuline Convent in Cork city which she would initially sponsor. Thus in 1771, the first Ursuline Convent was established in Ireland, a community made up of four Cork women who were professed at the Ursuline Convent in the Rue St. Jacques in Paris. However shortly after the Ursulines arrived, Nano was disappointed to discover that cloister prevented them from going to schools outside the confines of the Convent. It became obvious that Nano’s hopes and dreams for the immediate future were not to be fulfilled. 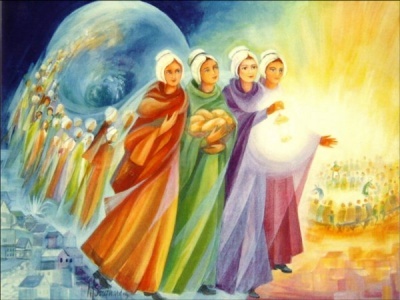 She determined to set up her own order, the Presentation Sisters of the Blessed Virgin Mary (PBVM) on 24th December 1775. And so to quote Sr. Ursula Clarke (Ursuline Annalist) “there were two religious communities both founded by Nano Nagle, working side by side” on Cove Lane (now Douglas Street) “and all living in mutual harmony and support”. Nano died from tuberculosis on April 26th 1784. Sometime before her death she had consented to be laid in our churchyard on condition that they (her own sisters) should also be buried there. This condition was agreed to. Over the past two and a half centuries, thousands have visited the little cemetery and seen not only the grave of Nano but those of the Ursuline and Presentation Sisters side by side. Nano Nagle was declared Venerable by Pope Francis on 31 October 2013. The Ursuline Sisters joined with the Presentation Sisters in their celebrations on Presentation Day , 21 November 2013 in Cork City.